And they’re off... as details of the 2012 Galway Races Summer Festival, running from Monday July 30 to Sunday August 5 were announced at the official launch in the g Hotel, Galway yesterday. Topping it all, the Galway Race Committee is proud to unveil the new Galway Plate, in association with Galway Plate Day sponsor, Tote Ireland, which has renewed its sponsorship for a further three years. Tote Ireland commissioned NCAD (the National College of Art and Design ) to design and manufacture a new Galway Plate for the 2012 festival which will be presented to the winning owner of the Galway Plate. Designed by third year industrial design student and Dubliner Matthew Lynch, the new plate, stays true to the origins of the original silver-plated design first created in 1869 but brings a new modern look to the trophy. Europe’s longest running racing festival, the Galway Races, kicks off on Monday July 30 with ‘Galway’s Best Hotels Race Day, where a collection of Galway hotels including; the Carlton Hotel, g Hotel, Hotel Meyrick, Radisson Blu, Galway Bay Hotel, Claregalway Hotel, Clayton Hotel, Galway Oyster Hotel and the Pillo Hotel have come together to sponsor the opening day of racing. The first race is off at 4pm with the feature race sponsored by the Carlton Hotel. Monday is traditionally ‘Sports Hero’ evening at the track, attended by many of the country’s leading sports stars descend on Ballybrit from the world of GAA including Galway’s senior hurlers fresh from their Leinster success, Connacht and Irish rugby internationals and soccer stars will mingle with renowned flat and jump jockeys. Today FM’s sports guru Paul Collins will take to the stage and check out the form and going with the stars for the week’s racing. Galway milliner Suzie Mahoney and TV3’s Noel Cunningham will also go in search of the ‘Most Appropriately Dressed Lady’, while a bridal party with a difference will open the first day of racing. The novel fundraiser in aid of Special Olympics will see ladies donning their wedding dresses once more to run 200 metres before the first race on the opening day of the festival. Topaz is once again the principal sponsor of racing on Tuesday July 31 when their three races are headlined by the €115,000 Topaz Mile EBF Handicap. Well-known western business Caulfield Industrial sponsor three of Tuesday’s races and the Latin Quarter Steeplechase is backed by Galway city's prime entertainment sector. Racing gets underway at 4pm. Wednesday, Galway Plate Day has a prize fund of €200,000 from Tote Ireland for the Galway Plate, the feature race when the newly designed Galway Plate will be presented to the winning owner. The first race off at 3pm and the entire card of racing is fully sponsored by Tote Ireland. The Guinness Galway Hurdle Handicap is the racing highlight on Thursday August 2, as Guinness continues its sponsorship of the €260,000 hurdle race – the richest national hunt race to run in Ireland this year. For the first time on Guinness Galway Hurdle Day, Galway Races will be staging its first listed race to be run during the Summer Festival. This race will attract some of the high class Fillies which are in training this year. Racing gets underway at 1.50pm. The ever-popular Ladies Day is an absolute must for fashionistas as Anthony Ryan’s celebrates 10 years of sponsoring the Best Dressed Lady Competition at Galway Races Ladies’ Day. Former Miss World Rosanna Davison joins the judging panel, alongside fashion editor of the Irish Independent Bairbre Power and editor of Social & Personal magazine PJ Gibbons. 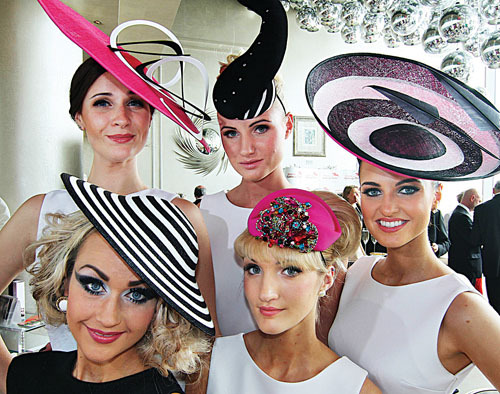 With a prize fund of €20,000 it is the premier fashion event on the Irish racing calendar. Friday August 3 is once again generously sponsored by Guinness and is the official designated Sports and Social evening, offering the perfect corporate or social club event for work colleagues or friends getting together for an evening of racing and craic. The first race is off at 5.10pm with a full evening of racing entertainment planned. ‘Ladbrokes Red Day’ on Saturday August 4 invites racegoers to dress to impress in red with fantastic prizes up for grabs for the winning outfit! Racing starts from 2.30pm and the main race of the day is the Ladbroke’s Handicap valued at €40,000. ‘Mad Hatters Day’ is Family Day at the races on Sunday August 5. Patrons young and old are invited to don a mad hat to be in with a chance to win fabulous prizes which will be judged by renowned Galway milliner Mark T. Burke. The top prize on the day is a trip to Milan, while the winning prize for the children’s Mad Hatter is a trip to Disneyland, Paris sponsored by Ireland West Airport Knock. The Connacht Tribune Handicap Chase is the main race on final day of racing with the first race off at 2.15pm with Easyfix, Galway Bay FM, Galway Shopping Centre, Martinstown Stud and the Trappers Inn sponsoring the supporting races. Children and teenagers under 16 years of age when accompanied by their parent(s )/ guardian(s )will be admitted free of charge to the Summer Festival Meeting. Any child or teenager who is unaccompanied by their parent(s )/guardian(s ) will have to pay the Student Admission Fee for that day. Be part of the Adrenalin-pumping action, heart-stopping finishes and breath-taking fashion from Monday July 30 to Sunday August 5 . For further details on the Galway Races Summer Festival 2012 and to avail of Special offers or group discounts please call 091-753870, email [email protected] or visit www.galwayraces.com Join us on facebook, facebook.com/galwayraces for all the latest information on this year’s summer festival meeting.